What kind of candy do you buy for road trips? We almost always bring tic tacs with us. We normally buy the orange Tic Tacs but I found these pink grapefruit flavored Tic Tacs at a giant truck stop we stopped at and it's something that has been on my list of candy to buy for some time now. These are not as easy to find, they aren't even listed on the Tic Tac Web Site. If you do find these, buy them! 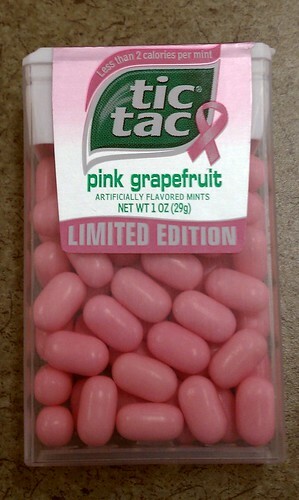 I like the tie in with breast cancer awareness, it is perfect for a pink grapefruit candy. The color on these is a great shade of pink which helped me find them easily among the other candy in the truck stop. There isn't a grapefruit smell coming from the container when you open these, but put one in your mouth and the grapefruit flavor is light and wonderful. These are made with real dried grapefruit juice and the flavor reflects that, it is natural tasting and authentic. There's nothing I hate more than fake citrus or fake anything flavors. I crunched a few of these in my teeth and the flavor is intense. It's a great flavor but you get a lot of it when you crunch these one after another. These also have a cooling feeling which isn't minty but it's a nice addition so these feel like a "mouth-freshener". They do make you smell like grapefruit, but that's a good smell to have on your breath! The only complaint about this candy I have is....Where in the world can I buy it on a regular basis? I'm a huge fan of citrus fruit and I'd love to find these to buy more often, but this is the first I've seen of them. These make a great candy for our road trip...small in size, non-crushable container, not melty, and full of fantastic flavor. Note: We are currently on the road traveling, pictures were taken with camera phone and we are reviewing candy as we find it.